Making Silver Springs Attraction a state park allows the Florida Department of Environmental Protection to continue its water quality work in the springs basin. TALLAHASSEE – The Florida Cabinet, sitting as the Board of Trustees of the Internal Improvement Trust Fund, today approved the modification of a lease agreement between Palace Entertainment and the state of Florida, allowing the property to become part of Florida's state park system on Oct. 1. Palace Entertainment's lease to manage the Silver Springs Attraction ran until Dec. 31, 2029. Through negotiations with the Florida Department of Environmental Protection, the state has secured $4 million in work by Palace Entertainment in order to restore the property to its natural condition, as originally intended by the Board of Trustees. Palace Entertainment will continue to manage the property until Sept. 30 and during that time the Silver Springs Attraction will be open. "We are pleased that the Governor and Cabinet have decided to approve this agreement so that the Department can return the property closer to its natural state, involve the community in recreation opportunity decisions and continue our efforts of improving water quality in Silver Springs, one of Florida's most iconic treasures," said DEP Secretary Herschel T. Vinyard, Jr. The Department will begin implementing the Interim Facilities and Operations Plan that was presented to the public Jan. 14 by the Florida Park Service. The long term unit management plan, which is required by Florida Statutes, is anticipated to be completed by September 2014. Turning the property into a state park is another step the Department has taken to restore Silver Springs. Also Wednesday, the Department's Division of Environmental Assessment and Restoration held the first meeting to finalize a basin management action plan for Silver Springs -- the first such restoration plan to reduce nitrates affecting the springs. Department research and monitoring led to designating Silver Springs and the Upper Silver River as impaired for nitrate, a form of nitrogen that causes excessive algae growth in the spring system. Last November, the Department finalized the total maximum daily load or, in this case, the maximum acceptable concentration of nitrate, at 0.35 milligrams per liter. This is the same restoration target that the U.S. Environmental Protection Agency has adopted for springs — based on the Department’s data — and that has been upheld in both state and federal courts. Meeting the restoration target will protect aquatic life and bring the system back into balance. 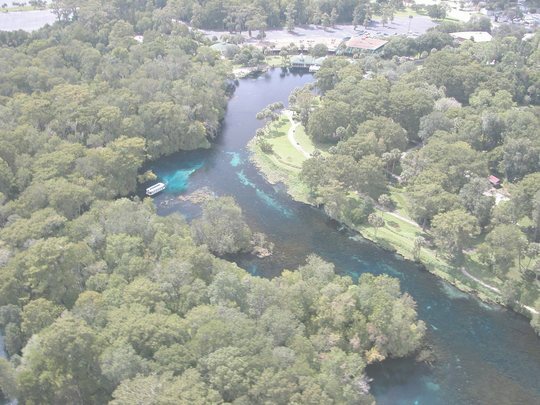 The Florida Department of Environmental Protection expanded its efforts to restore Silver Springs last July, committing more than $1 million to water quality improvement projects. The Department, Marion County and the St. Johns River Water Management District have identified the first project to benefit from this funding, committing $300,000, $300,000 and $100,000, respectively, toward the project. The project will eliminate a wastewater discharge from the Silver Springs Regional Wastewater Treatment Plant, which is within 1.5 miles of the main boil of Silver Springs. It will redirect wastewater to the Silver Springs Shores Wastewater Treatment Plant, which provides higher level treatment and is 10 miles from the head spring. In a subsequent phase of the project, a series of small “package” wastewater treatment plants also will be connected to the central facility, which will provide better treatment and reduce pollution. Implementation of these actions collectively will eliminate more than two tons of nitrogen currently going into the Silver Springs system every year. The Florida Department of Environmental Protection is the state’s principal environmental agency, created to protect, conserve and manage Florida’s environment and natural resources. The Department enforces federal and state environmental laws, protects Florida’s air and water quality, cleans up pollution, regulates solid waste management, promotes pollution prevention and acquires environmentally-sensitive lands for preservation. The agency also maintains a statewide system of parks, trails and aquatic preserves. To view the Department’s website log on to www.dep.state.fl.us.